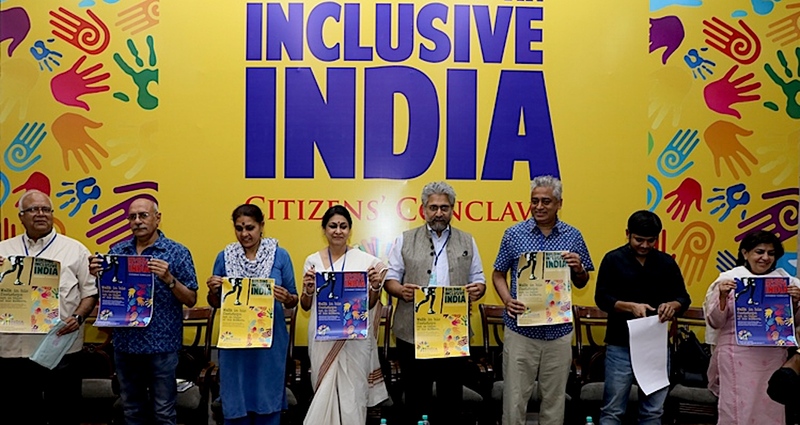 New Delhi: To bring together likeminded and concerned citizens including activists, journalists, historians, academics, students and other civil society members, a three day Citizens’ Conclave which was inaugurated on May 25th came to end on Sunday, May 27th. India Inclusive as a platform was born out of the urgency to defend the diversity, pluralism, democracy, constitutional values and justice during the current state of chaos that the country is going through. One of the few who built the India Inclusive platform, Dr. Harshvardhan Hegde (Senior Orthopaedic Surgeon) opened the conclave by acknowledging the anger and frustration of the citizens of the country. “We as thinkers need to get together, settle our differences and think of a larger solution to the conditions we live in,” he said. Shabnam Hashmi, fellow founder of India Inclusive and social activist also urged everyone to forge their solidarities to build a more cohesive and peaceful country. The first session of the day was titled, “Democracy and Dissent”, it was chaired by senior journalist, Om Thanvi. The session was addressed by Iftikar Ahmad Khan (Associate Professor), Jagmati Sangwan (Women’s Rights Activist, Former AIDWA Gen. Sec), Kanhaiya Kumar (Student Activist, AISF, CPI), Meeran Chadha Borwankar (Former IPS Officer), Rajdeep Sardesai (Senior Journalist), Saba Dewan (Documentary Filmmaker), Siddharth Vardarajan (Journalist) and Usha Ramnathan (Academician). Jagmati Sangwan and Saba Dewan both presented the need for the unification of various struggles, resistances, movements and communities. By referring to recent incidences of honour killing, xenophobic clashes and religious intolerance, Jagamati Sangwan called for a collective realization, “It is important to observe and learn from the events of the last four years in the country. The marginalised of this nation have been forced to live without their rights and freedom while the oppressors have been overcompensated with the same” she said. While talking about the changing political and social currents in the country, Meera Chadha Borwankar and Siddharth Vardarajan reiterated that the Indian society needs to recognise that the state gets away scot free by pitting one community against another. When the clashes occur and dissent is born out of it, those who see through the fog of manipulation are penalised and labelled as anti-national. “The State engages us in senseless debates, it fuels xenophobic tendencies and communal ideas and we need to rise above those illusions and stop ourselves from getting disengaged with democratic processes,” said Siddharth Vardarajan. She urged the audience present to look beyond the promise of technology and to question it at every step. The second session titled, “Education for Inclusive India” was chaired by Professor, Miranda House, Abha Dev Habib. The session was addressed by Fahad Ahmad (Gen Sec. TISS SU), Kawalpreet Kaur (President AISA, DU), Manasi Thapliyal (Assistant Professor, AUD), Pooja Shukla (Student Leader, Lucknow University), Richa Singh (Student Leader, Allahbad University) and Munna Sunaki (Student at HCU). Fahad Ahmad added to this conversation by talking about the threat of privatization. She also said that looking at the conditions of women across universities in the country, it is time to first ensure the survival of the woman and then her education. They both also reiterated that as long as there are classrooms in the universities, educators and students will breed critical thinking. Munna Sunaki spoke at length about the need to replace the current education system and replace it with Ambedkar’s model of Inclusive Education. He reiterated Ambedkar’s principles of Education, Organisation and Agitation. He also brought attention to the fact that the infrastructure and education being provided in most universities is severely inadequate. It has led to students committing suicides and that has to addressed urgently. Pooja Shukla and Richa Singh both spoke about the discrimination being faced by SC/ST and OBC students, the limited opportunities that are given to Muslim students and women. “They don’t want the poor to be educated because if they rise in station through education, they will transform the system for good” Pooja said. “This government is trying to make sure that history is re-written by traitors and this new India that is being built, we will reclaim it.” She said. Richa Singh talked about the threat dissenting students face in Universities, “Being labelled as seditionists and traitors, we are being demonized and our ideas of freedom and democracy are being delegitimized,” she concluded.